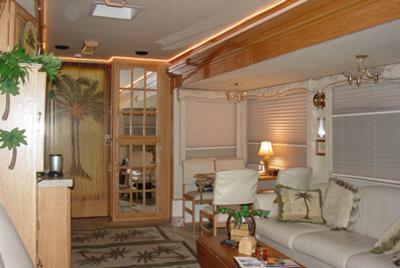 The Vaden's theme for their decor is palm trees, and they named their RV "Paradise". That is the most gorgeous I have ever seen. It sure puts my little "Georgie Boy" to shame. When I retired last February, I wanted to take my small retirement fund and buy a newer (not new) motor home, sale the home, and travel. My husband refused. He said, "I have to have roots!!" Roots??? Isn't that something that trees and plants have?? I thought that was the reason God gave us feet and not roots, so we could move around and see this beautiful world he created for us. Well, here I am sitting in front of my computer, almost 62 yrs old and getting older by the minute. I sure do envy all of you RV'ers. Enjoy your lucky lives and count your blessings. You sure have a lot to be thankful for. 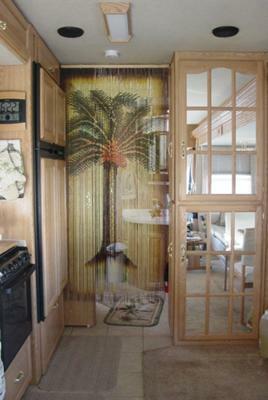 Oh, and thank you for sharing your photos of your delightfully lovely and professionally decorated RV. Now go and enjoy it. God Bless you and keep you safe. I planted a leyland cypress and moss in a pot. Puts my little 1986 Minnie Winnie to shame! Very nice! We will be at our place in the woods this coming weekend. Our season is just about over....... cold enough last night up there to freeze stuff! Looking forward to the day we can pack up and just go. I wanna go! We can not wait to become fulltimers. We are gonna purchase a 5th wheel with the garage option as we have turned into avid Motorcyclists. Our plans also include using the upper lift bed as a storage loft for things such as sea kayaks and snorkeling gear. What an adventure life shall be.